Day 4 in the potty training house and all is going quite well. It has been an exhausting few days for Lucia and myself, but she is doing amazingly. She caught on really quickly this time – she clearly wasn’t ready at our last attempt – and has been using the potty pretty well with plenty of bribery! Today she has developed a bit of a fear and there has been a few tears, but i think this is a normal phase and hopefully it won’t last too long. We are so so proud of her! Of course we have had a few accidents along the way but that is all part of the learning. Day 1 out of her compression and come evening I couldn’t believe the difference in her leg and foot though. Usually when we do her massage both legs feel equally soft and shapely. That evening her right leg was more swollen, felt hard, it was pitting which it hasn’t done in an extremely long time, had lost its shape and her poor foot was so swollen it looked painful. So we had an extra long massage, put the pink cure tape on her foot and hoped overnight things would settle a bit. Day 2 and the tape really helped her foot. I also put on the knee high compression that we had got for the summer (but she had never worn) for a few hours in the afternoon to try and stop the fluid building up so much and it definitely helped. Day 3 and the tights went back on. I was too nervous to leave them off any longer as I could see the detrimental effect being out of them was having on her Lymphoedema. So we went with it and she had no accidents! Now we are just doing extra treatment to try and get her Lymphoedema back to the way it was before those few days out of her garments and we are getting there. It is crazy the difference a few days can make when it comes to Lymphoedema, it shows just how quickly things can change for the worse and just how important everything we do on a daily basis is. It is also crazy the difference a few days has made to Lucia – how my little baby in nappies is now a big girl in pants. I know we are by no means finished and the potty training will continue on but there is no going back. My mum will be taking over for a few days now while I go to work (and get a breather from it all lol), so good luck mum! Well done over another hurdle…. Breathing a sigh of relief! Well done, hope it’s still going smoothly. 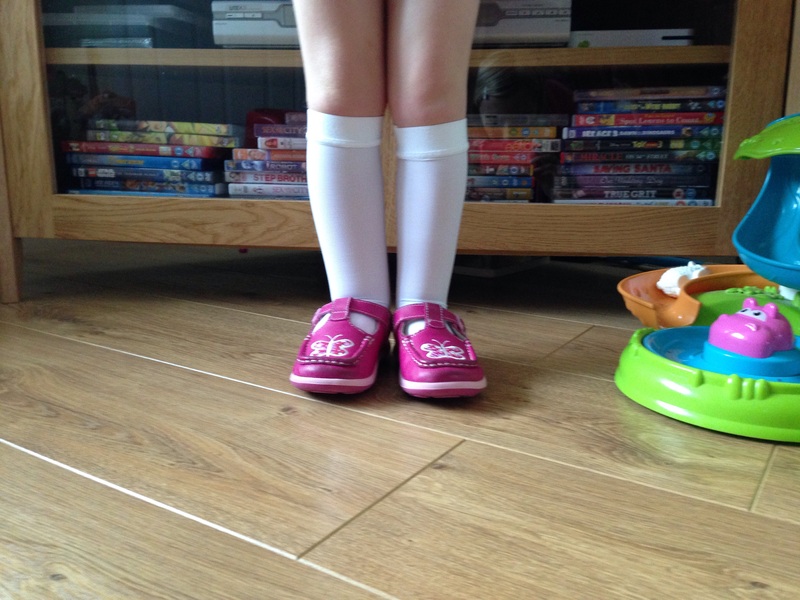 I love the picture of little miss in her knee highs and beautiful shoes. i managed to get a cheap pair of Hello Kitty slip on’s for Isla in H&M the other day. Bought two pairs so i could accommodate her different sizes, she was so pleased with herself and her new shoes i could have cried (again).